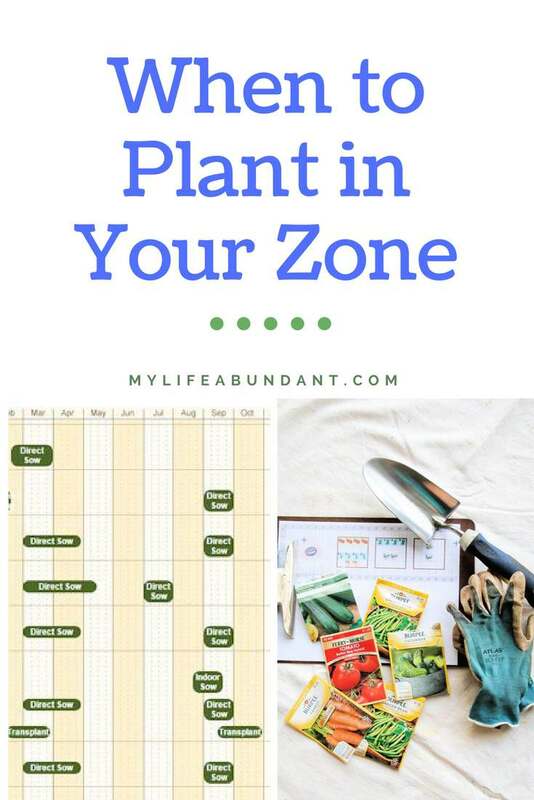 When its time to start your garden, before you begin, you must find out the Zone you live in. Planting your garden in your zone is key to success. Let me show you how. 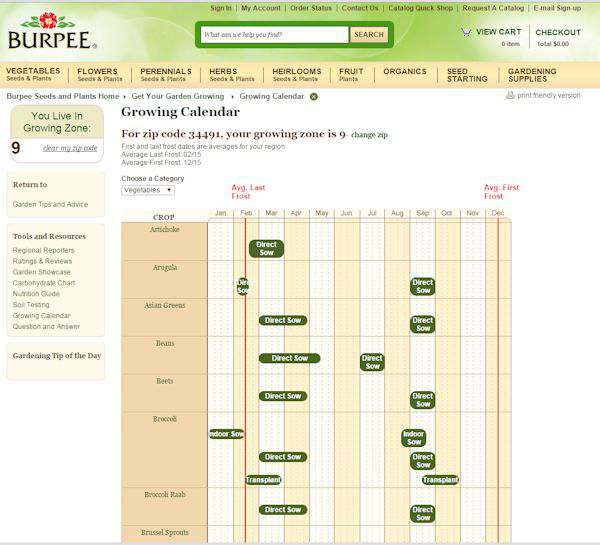 Have you ever wondered when the best time to plant is in your zone? Do you start your seeds indoors or direct seed? Even after having my small garden for one year, I was still questioning myself on when I should be planting and now that I am planting using square foot gardens, I wanted to find out what needed to be done first. 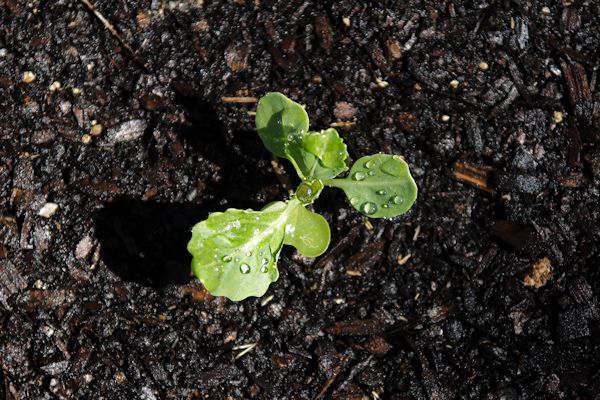 Your growing zone does make a difference when it comes to planting. But, there are exceptions to every rule. I live in Zone 9 and the average last frost date is February 15th. But where I live is a bit lower and my average last frost date is March 15th. So where your house is located could mean the difference in your planting by a few weeks. The best growing calendar I have found is at Burpees. They have a great growing calendar where you simply put your zip in and it gives you the times to plant either by direct sowing of seeds or transplants. The screenshot above is just the top part of the whole list. It will show you what and when to plant for the whole year. This chart is also printable and makes it easy to keep handy. There are other great gardening resources found on this website. I like to keep information from year to year in my garden journal book. There are so many resources out there to help you decide your sweet spot on when to start planting in your area after your last frost. Zone 9 actually has 3 different planting areas and I live in the middle of the 3. I follow a blog called Central Florida Gardening and really enjoy how they explain planting in the 3 different areas of Zone 9. I love how they break down each month and what to do. So, do a search for blogs or newsletters in your zone area for tips. Someone else’s experiences can teach a lot. My first garden mistake this year was I didn’t look up the chart information until the first of February and realized that the cabbage seeds I just planted were going to be late. And it was. About a month late and as you can see in the picture above, they have hardly grown in about 6 weeks. So, I will plant seeds the first of September and see how that works. Another mistake I have made this planting season was I didn’t figure how many days some of the plants need till harvest that I planted on the first of February. So, here it is March and I need to plant my green beans and I don’t have any open space. So, I ended up going out and buying another section of square foot garden kit to sit next to the one I already had. Since the first one was given to me, I wanted to get the same one and wouldn’t you know that the company that made the first one changed the design a bit. You can find these at a lot of the big box stores and very reasonably priced. The lettuce and peas are growing strong and my tomatoes I started in the house are planted with my first stage of green beans. In a couple of weeks, I will plant another variety of green beans in the middle box since my cabbage isn’t going to make it. We love homegrown green beans and I want to stagger the planting a bit. I have been harvesting a bit of my spinach and lettuce in the big pot on the back porch. I love a fresh salad. And with gardening comes repairs to your equipment. I already had to cut part of my watering hose off to get rid of a leak. This hose has already been repaired once so this will be an easy fix for me to tackle with helpful hints from hubby. Here is a layout of my garden right now. Well, I hope it looks like this at the end of March. There are a few squares that I will decide later what to put in there. Maybe some more green beans. I can’t wait to tell you about my Garden planner at my next update. It really does help with planning. 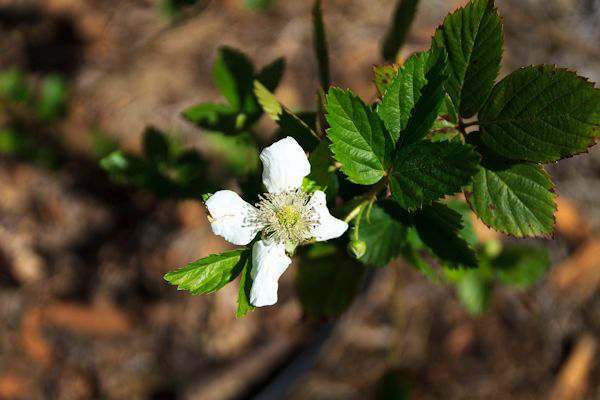 The blackberry bush is blooming well. 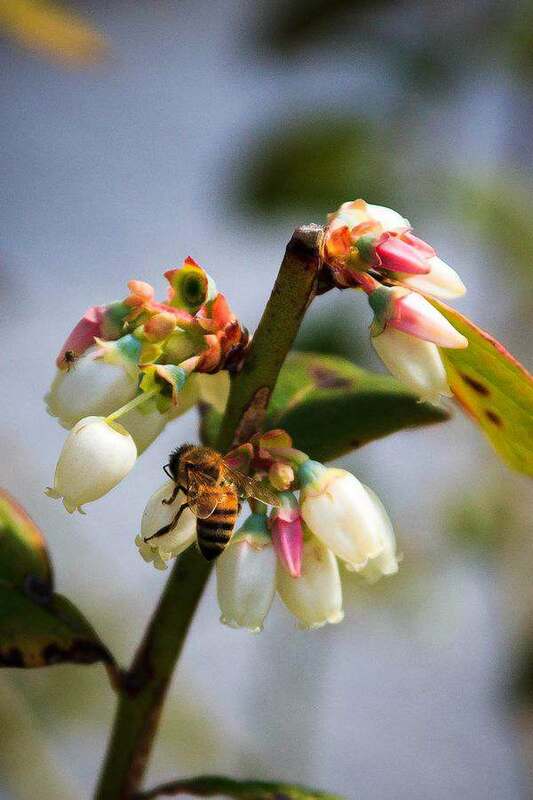 And I was so pleased to see bees all over my blueberry bushes working hard to pollinate. The bushes are close to my garden, so I am hoping they stick around to help pollinate there too. What is your plant zone and are you ready for this growing season? Such great information. My Papa and Daddy were/are great farmers, but my green thumb doesn’t exist at all. I plan on starting a mini garden on my balcony this spring, so this will come on quite handy. Thanks for sharing! I think I am in zone 7. I used to know well the times to plant things when we lived in Mississippi. When we moved to TN 5 years ago all that changed and I haven’t learned enough about planting times here. We live in planting zone 8. It isn’t quite yet time for setting out summer gardening plants but soon. We usually have one last frost before Easter. Those water hoses are always a problem, aren’t they. We finally invested in a couple of more durable expensive hoses which we have kept for a few years now, well worth the extra money. We will break out that patch kit when the time arises though, and it eventually will. Thanks for stopping by Shirley. You are so right about buying a nice hose. The hose I had to repair was a really good hose my hubby found in a house he was flipping years ago and there were some burned areas on it. And one of the burn areas is what split last week. I bought one of those squishy lime green hoses you see on TV so I could keep it in the garage and use when I needed to give the dog a bath. Well, that lasted 2 whole years. And what a disappointment because it was so easy to carry because it was so lite. Oh well. You do get what you pay for sometimes. Good luck with your garden and I can’t wait to start picking my blueberries. Thanks for stopping by Emily. The growth calendar is a huge help. HI Danita. I bet there is something out there you can grow. If you like herbs, start there. Try rosemary first. Its pretty hardy. California weather makes planting easy, but keeping the squirrels out is a challenge! I hear ya Maryanne. Snails are a problem here in Florida and they love to chew on everything in the garden. Love the post. I just bought some strawberry plants as spring is in the air. Unfortunalty, it totally slipped my mind that the ground is not just frozen, it is still covered by several feet of snow :-(. Hi Julia and thanks for stopping by. I have one tiny strawberry plant. They are kind of hard to grow here in Florida. They need more cold then what we have to offer and a lot of times the runners don’t come back. Blackberries 🙂 yum. Note to self…I need to go trim my momma’s blackberry bush. lol. All I’ve got coming up so far are tulips. daffodils and romaine. I can’t wait to see everything else pop up out of the ground. My goal this summer is to only buy meat, milk and some bread from the store. When I was told that I needed to rim my blackberry and blueberry bush to half its size after the fruit has been harvested, I just refused to believe that is what is suppose to happen. Well, that’s whats suppose to happen and it does help them grow full and with more fruit. Thanks for stopping by Lauren. This is great information. I promised my kids we’d try growing some veggies this year, so I’ll have to check it out. Thanks for sharing. And I love that photo of the bees! Hi Meredith. Good luck with your garden. Can’t wait to hear about it. I’m so glad you posted this! Thanks, Tammy. I made the mistake of mentioning a garden this year to my son. He was so excited that I’m locked into it now :). It looks like I’m zone 6, so I better get started on this!